Sugar cookie lovers, where are you? You’ve got to try these new maple glazed sugar cookies! They’re thin and chewy with the perfect crispy edges. I’ve baked a whole-heck-of-a-lot of cookies in my day; everything from simple sprinkle chocolate chip cookies to festive pumpkin ginger molasses cookies and I never, ever get sick of cookies. Nope. I do; however, run out of ideas and I have to get creative when I’m brainstorming new recipes though. Actually, that’s how these maple glazed sugar cookies came to be! Wa-la! With just a few changes and a few added ingredients, it’s a whole new cookie! Maple glazed sugar cookies! And just so you know, these little cookies have the best texture; they’re chewy in the center and crispy on the outside. They also have just the perfect hint of maple in the frosting, which is hands down my favorite part. As I mentioned above, this is a small-batch recipe (you know that’s kinda my thing – wink), so it only makes about 2 dozen cookies per batch, but if you’re feeling really hungry, you can easily just double the recipe and make more! If you have a list going for all the things you want to bake this fall (me! ), don’t forget to add these maple glazed sugar cookies, they’re sure to become a favorite! Soft and chewy maple glazed sugar cookies are the perfect afternoon treat! Add flour, half at a time, and mix until fully incorporated. 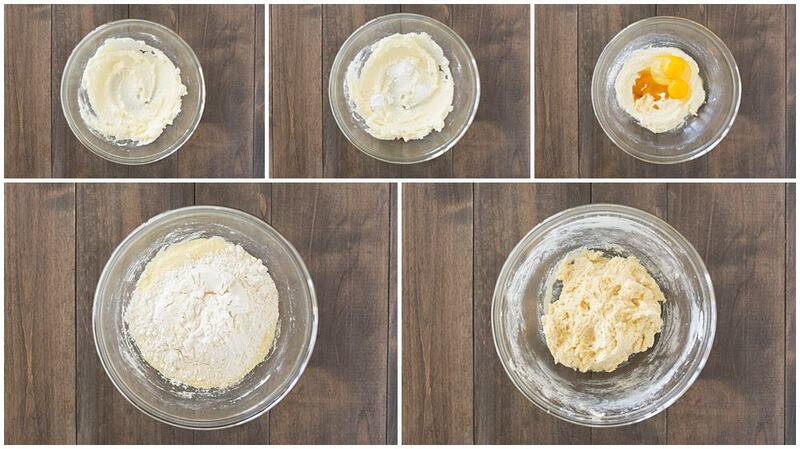 In a small bowl whisk together all ingredients until smooth. When cookies are fully cool, drizzle glaze over cookies. I love all cookies, but haven’t made sugar cookies yet. There are just so many different thing to make. I love how you add maple to this recipe, so perfect for this season! Thank you Trang! These are for sure one of our favorite cookies! Yeah, you pulled me right in. I LOVE sugar cookies and I am always using maple syrup so you know I love that too. Thanks for the delicious recipe. Thank you! Hope you love them Ginny, we sure do! These cookies would be delicious with milk!! Now these sound like my kind of cookies – they look totally delicious! Thanks so much, Bintu! I agree with you – they might be my VERY favorite! I’m always looking for ways to use up leftover maple syrup and this looks like the perfect recipe! My husband is going to love these! Saving now! Oh my lanta, these look so good! Saving this for sure! Haha Lauren! Thank you so much! Hope you love ’em! You had me at ‘Maple”! These sound delicious ? I think I’m going to make these for Thanksgiving ! Thank you Chelsea, I hope you love them! Haha, I love this Dahn! Woohoo for the sugar cookies! Thank you so, so much!